Water scarcity and the high consumption of water resources in agriculture have strengthened the need to manage and optimize irrigation systems. Among surface irrigation systems, furrow irrigation with cutback is commonly used because of its potentially higher irrigation efficiency, lower costs and relative simplicity. The performance of this system is affected by various management and design variables, and hence different management scenarios should be evaluated before it is applied in practice. For this purpose, empirical functions for the performance evaluation indices are useful. This paper employs sensitivity, dimensional and regression analyses in the development of empirical functions for application efficiency, deep percolation, runoff and distribution uniformity. The proposed functions were evaluated using a numerical zero-inertia model and field measured data. Coefficients of determination for E a, D r, R r and U cc were calculated to be 0.90, 0.91, 0.90 and 0.84, respectively. These values indicate that the proposed functions enable the performance indices to be predicted satisfactorily. Values for the indices calculated using the developed dimensionless functions showed a very good agreement with both the outputs of the zero-inertia model and values calculated from measured field data. 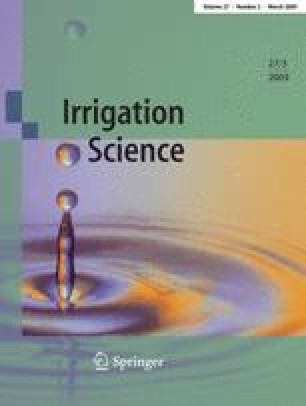 As the functions were general (not site and irrigation specific) and explicit, they could prove to be of practical significance in both conventional and optimal design and management of free-draining, graded furrow irrigation systems with cutback flows.